Over the course of this term, we as a group have experienced a rollercoaster of emotions and uncertainty, however, at this point as we near the end of the term, we feel as though it has been incredibly rewarding. From being assigned to groups not knowing our projects, to completing our data collection and map trialing with community members, there have been many obstacles that we collectively managed to navigate. Moments such as learning about our project at the info session with Vancouver Coastal Health, and coordinating the trialing of the map. The moment of significant change activity showed our group how we were able to cope with uncertain circumstances, such as learning about all the assets we were to map for the project, working out times to trial the map with community members, and planning out our infographic and final report. 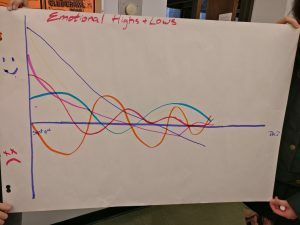 Through the graphs of significant change we also realized that each group member had a different view towards emotional highs and lows with each significant moment. Even though we each had these different views, we were able to work effectively throughout the term and finish set goals on time. The low point in our project was the trialing of the map with our community partner. Due to our schedules and the limited availability of time slots at the community event, we were initially unable to make any of the trial events as a full group. Facing uncertainty and pressure from our set goals, we came up with a plan to send one of our group members to one of the events. This was a great learning experience for us in terms of planning as Schulman mentions, “without a certain amount of anxiety and risk, there’s a limit to how much learning occurs” (Shulman, 2005). The trial with community members went well and we received good feedback about the food asset map. Working through our infographic, we each had our own idea on how the infographic should look. However, we were able to compile all our ideas and effectively displayed all of the important information we wanted to present. During this process, each of us received much feedback from one another’s various perspectives. With the data we collected from both quantitative food assets and qualitative community member feedback, we aim to complete our infographic presentation as well as write up our final report. Future considerations regarding the constant updating of the map may need to be implemented, and can be accomplished by future LFS 350 students. This is important an up to date map can best be utilized by the community members we are trying to assist. In regards to completing our presentation and final report, we aim to distribute the work over the last 2 weeks of class as to avoid rushing near the deadlines. Constant communication between group members is important in keeping up to date with our schedule. Work distribution will be discussed through these conversations and should any group member have issues regarding their portion of work, then we will further discuss and arrange other plans. Time is tight especially near the end of term and management of time is extremely important with each of our busy schedules. However, we must face these challenges and finish well in this course after investing so much hard work into our project thus far. I believe we are all committed as a group to finish well and end with a sense of accomplishment for our work with the community. During this phase of our project, we aim to wrap up the collection phase of food assets and compile all our data in preparation to submit to Vancouver Coastal health to update the Food Asset Map. In the following weeks, we hope to begin working on our project infographic and presentation for a completion date of November 27-30. Keep up to date on group chats and upcoming assignment due dates. We hope to follow the above schedule to obtain results from community members and compile their results into our infographic and final report. Data collection portion of Vancouver Food Assets is mostly complete. Project Proposal has been reviewed and condensed in preparation for project infographic. Discussion has begun with our community partner in regards to facilitation of map trailing. 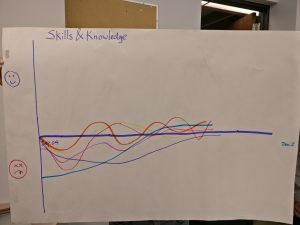 The workshop was a valuable experience for our group to look into each other’s state of knowledge, skills, and mental states. It was certainly an eye opening activity to find similar patterns in the group. We all had similar tendencies in terms of emotional levels, with a gradual decrease over the term with projects, tests and other commitments, however we agreed that nearing the end, we should see an overall increase in emotional levels. It was also rather nice to see that other groups have had a similar outlook in terms of emotional outlook for the course. During the individual portion, we all found it rather difficult to specifically label points of change, as they were more gradual changes. These changes in both graphs were represented by a series of events as we worked our way through deadlines and setbacks. Although we cannot say for sure how these graphs will change in the next month, it appears that the variation in emotional ups and downs seems to be tapering off which may be due to a slightly clearer objective as we close in on our final presentation and report. As we come close to the next deadline, we should expect some uncertainty, which we have dealt with as a group before with previous assignments. 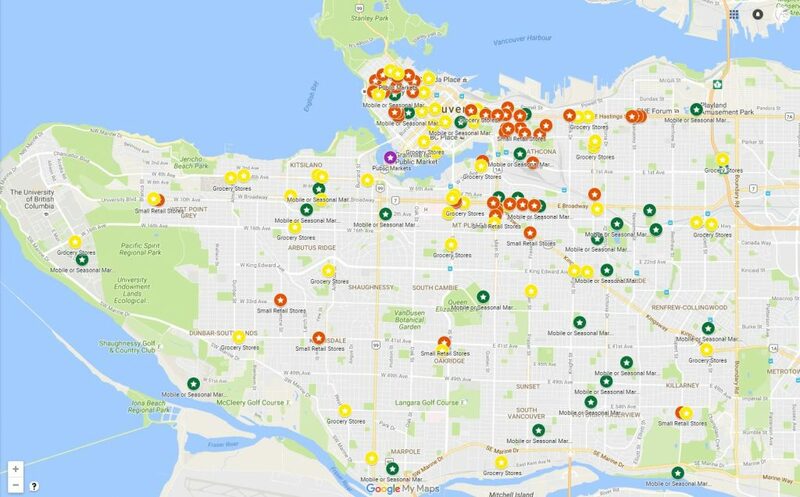 With the next part of our project encompassing community engagement, in the form of trailing the Vancouver Food Asset Map in the Renfrew-Collingwood Neighbourhood, there may be some moments of significant change for both our graphs during and after our map trialing. However, with uncertainty, brings the opportunity for learning as Lee S. Schulman in the article “Pedagogies of Uncertainty”, these moments of uncertainty emulate the difficulties and hardships that we may face in our careers in the near future. This opportunity for us to have a first hand experience with the continuation of this project, we are able to exercise our abilities to cope with uncertainty to develop ourselves into professionals in our field (Shulman, 2005). We as a group have confidence that we will be able to overcome any unexpected challenges. With the help from this workshop, it reminded us that we will always have ups and downs which are beneficial for our overall development. We will continue to work towards finishing our project and discuss with each other should problems arise. Pointing out problems quickly can help us reach a resolution and better enable us to focus on the project. We have decided as a group that in order to finish off well on this project, we must be able to discuss our findings from both map data collection and community member feedback to establish the ability of the Vancouver Food Asset Map in helping those in need achieve food sovereignty. We must define specific terms and articulate who in fact is “in need” for this asset map. We aim to gather accurate information through online resources and analyzing community member feedback through an ethically designed anonymous questionnaire to determine our target audience and usability of the map. For our next task, we are organizing and interpreting the quantitative and qualitative data in order to create an info-graphic to articulate our findings, as well as a final report to summarize our whole experience with this project. We aim to continue the data collection phase of our project in hopes to fill out the remaining blanks for recorded food assets. In the following weeks, we each aim to each cover a neighbourhood in Vancouver and record as many food assets as we can in our designated neighbourhoods. Ongoing Objective：Keep in contact with the group Facebook Chat for any updates regarding this project. This allows our group to be up to date with all current project information. After the introduction to our project at the Evergreen Community Centre, we learned the scale of our project and how important food assets are to a neighbourhood. We were later assigned the Renfrew-Collingwood Neighbourhood as our community in which we were to present the final Vancouver Food Asset map in November. Afterwards, we were ready to begin working on our project proposal. The most significant part of our project so far was creating our group proposal. We found it rather challenging to clearly articulate our ideas into a formal piece of writing, as we each had a take on what we thought the proposal should look like. However, in the end, with guidance from Will and Francisco, we managed to agree on several main points that would be the basis for our proposal. In the beginning of writing the proposal, we had some difficulties assigning sections to each group member, as we all had ideas to contribute for each section. We resolved these issues when we decided to brainstorm for a rough copy of the proposal before completing the final copy. Through our collaborative efforts we were able to produce a project proposal that collectively satisfied our group. We learned that through sharing ideas with one another, we were able to gain a different perspective and further improve our own ideas. Although at times it might have seemed difficult to coordinate the writing of our proposal, we were able to realise our problems and further enforce our roles in the team to accomplish this task. 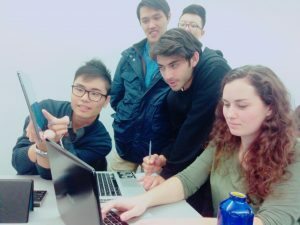 Being able to balance a friendly environment between group mates and getting work done was incredibly rewarding in the end of this proposal, as we pulled through and learned how each other worked. Learning how each of our group members works through this first assignment allows us to better prepare for future collaborative group work. We all aim to do what is best for our project and by accepting each others ideas and criticisms, we can all effectively work towards our set goals. Ernest Wu, Plant and Soil Science, interests include: biking, nature walks, travel. Zilu Ye, FNH.Interests include: travel,hiking,and cooking. 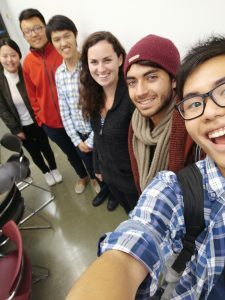 Our collective interests as a group include food security and food sovereignty and the importance of learning about these issues in the real world through first hand experience. 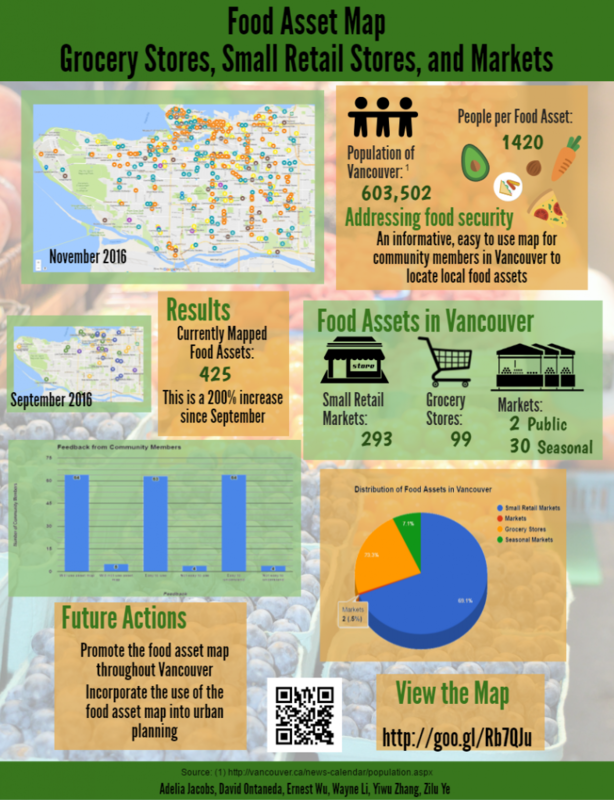 In this project, our goal is to highlight specific food assets, such as grocery stores and small food retailers, within the neighborhoods of Vancouver, and use this information to contribute to the on-going Vancouver Food Asset Map. In addition we will also collaborate with community members in the Renfrew-Collingwood neighborhood for the trailing and testing of the applicability of the Vancouver Food Asset Map with the targeted local residences. Our intentions for this project is to further quantify where food assets in Vancouver are located and address the key aspects for creating food security through the presence of grocery outlets. The development of this map is intended for use by people in need of locating nearby food assets and providing them with details on store hours and proximity of their location. For example new immigrants to Canada is a target demographic that can benefit from the usage of this map to locate culturally appropriate grocery stores that offer foods suited to their palate, which may otherwise be difficult to find. Throughout this project we hope to gain insights into food security in Vancouver and better understand the impacts of community networks in the city. We also hope to contribute to the community by helping those in need through the development of this map to access a wide variety of grocery and small retail stores near their location. The first part of our project entails a collection of data relating to grocery, markets and small food retailers. Information such as addresses, opening hours, and any contact information will be necessary to providing relevant information on the Vancouver Food Asset Map. With this map, we hope to create an easy to use platform for those who are food insecure. For this project we are working closely with Vancouver Coastal Health and other partners to complete the task of populating the map to a significantly more detailed level and debrief after data collection. In the second stage of this project, we aim to clearly explain to community members in the Renfrew-Collingwood neighbourhood how to utilize the food asset map and use their feedback to further develop and enhance the ease of use and information on the map. We will be working to integrate food assets within the community into the map and asking for feedback/ community input on the map. Community input can be crucial in the development of the food asset map as the logistical concerns and ease of use of the map is determined upon its acceptance within the community members. We must listen to the community members instead of interpreting our data with a closed mind. As Ernesto Sirolli said in his Ted Talk “the most important thing is passion, if you give someone an idea and they don’t want to do it, what are you going to do?” and “I do something very very difficult, I shut up and listen to them!”. We intend on listening to community members without imposing an idea on them and fully take in what they have to say about the Food Asset Map. Going into the meeting with Vancouver Coastal Health and other project partners, we had only a vague understanding of what exactly we were expected to accomplish, however, we listened to what was needed to help complete the task of finishing the Food Asset Map and we left with an idea of what is needed, what needs to be done, and how we could approach.